Outline: Tells of Mary, the angel coming to her and also to Joseph. They both believed and accepted the message. Jesus was born, grew up, went about teaching and healing. His power, love, death and resurrection. Invitation. Before Jesus came to this world He was in heaven with God. When God made the world, Jesus helped Him. Then, much later He came to the world in the form of a man. Now I will tell you how it happened. There was a virgin named Mary. She had never slept with a man. She was planning to marry a man named Joseph. Before getting married God sent an angel to talk to Mary. The angel said to Mary, "Don't be afraid. God is pleased with you. So God is going to give you a son. God's own Spirit will put the child in you. His name will be Jesus. He is going to save the people from their sins." That's what the angel said. The angel answered her, "This will not be the son of a man. For that reason you will call him `the Son of God.'" Then the angel left. Then Mary was content because she believed what the angel had said. Afterward she went to another town and stayed there three months with some relatives. When she returned Joseph saw that she was pregnant. Then he was troubled and planned to leave her. Then the same angel came to talk to him. The angel said to him, "Don't be afraid to marry Mary. She is pregnant because of the Holy Spirit. When the child is born give him the name of Jesus. He is going to save the people from the punishment of their sins." 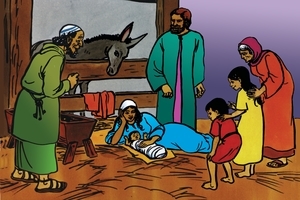 Then Joseph married Mary but did not sleep with her until after Jesus was born. Jesus grew up a good boy and when He was 30 years old He left the house of His parents. He began to go from town to town teaching the Word of God. He also healed many sick people. He made the lame to walk, and the blind to see. He made the deaf to hear and the dumb to talk. He cast the demons from people who were controlled by them. He could do this because He was the Son of God. He came to help people. He saw their sinfulness, but He loved them. Because of His love He was willing to die for all people. By dying He made payment for our death. Believe on Jesus. He has power to free you from Satan and all evil spirits. He will do it for you if you ask Him. Talk to Him now. He will hear you. GRN has recorded a version of this script in 360 languages and dialects. See full list.